The vision for the Centennial Trail began back in 1994. By 2017, the Weber Pathways nonprofit organization announced the completion of this 27-mile trail that starts at the mouth of Ogden Canyon, travels west along the Ogden River Parkway, then heads south on the Weber River Parkway until turning east through the towns of South Weber and Uintah, and then back north up Skyline Drive to access the Beus Canyon Trail and the Bonneville Shoreline Trail. All in all, the Centennial Trail forms a loop around Ogden and the surrounding towns, linking together the greenbelts along the Ogden and Weber rivers, a portion of road riding through several Weber County towns and scenic mountain biking in the foothills of the Wasatch Range. Along the way, this network brings cyclists to some of Ogden’s main attractions, offering a unique way to build a custom tour with stops at various points of interest. While it’s possible to ride the Centennial Trail in its entirety, most cyclists prefer to select portions of the trail that suit their abilities and interests, whether that be lung-busting mountain bike climbs or cruising around city parks on gentle asphalt paths. To help plan your route, here’s the lowdown on the four main sections of the Centennial Trail and what they have to offer. Running 4.7 miles through the heart of Ogden, this paved trail starts at the mouth of Ogden Canyon and travels west along the Ogden River until the confluence with the Weber River. Perfect for a relaxed bike ride, jog or walk, the parkway is a favorite for locals and visitors alike to get outside and enjoy the natural beauty of the river as well as some fun parts of town. 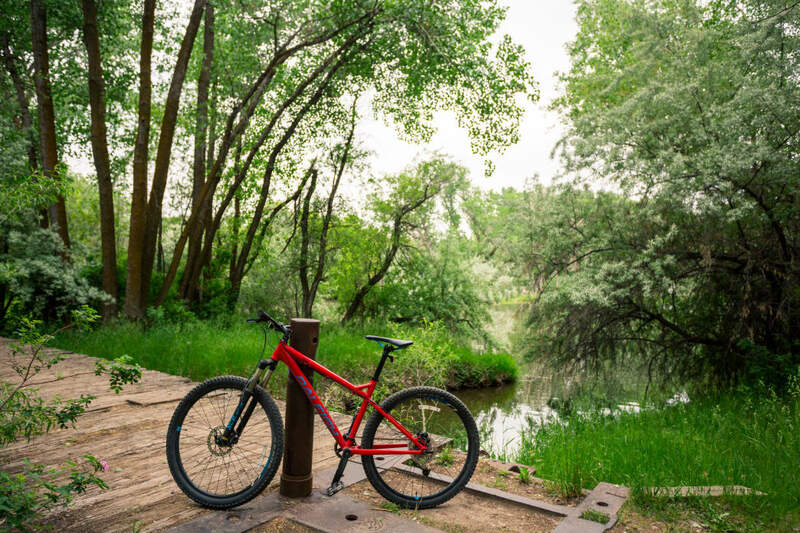 As the path travels beside tranquil stretches of river, natural wetlands and ponds, it connects many of Ogden’s best parks and attractions. To make the most out of a trip down the Ogden River Parkway, plan time to stop and explore some of the main highlights. A must-stop for those biking with children (or with a childlike affinity for extinct reptilian creatures), the Dinosaur Park boasts more than 100 outdoor dinosaur sculptures. While you can spot a few of these replicas towering above the fence from the bike path, you can get the full experience by going into the park and checking out the 8-acre dinosaur habitat as well as the Stewart Paleontology Museum and the Ogden Natural History Museum (included with admission). This 11-acre public park features nearly a dozen demonstration gardens, pavilions, an outdoor classroom, picnic areas and plenty of lawn space for relaxing. The Ogden River Parkway passes right through the beautifully designed Entryway Garden, which makes for an ideal place to park a bike and explore the grounds on foot. Some of the must-see gardens include the Water-Wise Perennial Garden, the Oriental Garden and the Rose Garden. Approaching the confluence with the Weber River, Ogden’s 21st Street Pond provides a short but scenic detour from the Centennial Trail. An easy, 1.2-mile paved path loops around the pond, bringing you closer to vibrant willow groves and plenty of ducks, turtles and birds. At the confluence of the Ogden and Weber rivers, the Centennial Trail begins heading south on the Weber River Parkway. A large picnic pavilion marks the junction between the two parkways. Following along the banks of the beautiful Weber River, this 12-mile path travels through the towns of Marriott-Slaterville, West Haven and Riverdale. Though parts of the trail include road crossings and more urban settings, these short sections only help to make the stretches of natural greenbelt beside the river feel all the more peaceful. While cycling this portion of the Centennial Trail, take your time to appreciate the diverse ecosystem of willows, cottonwoods, reeds and wildflowers coming alive with the songs of sparrows and chickadees to the steady flow of the river. Along the way, stop and take in some of the highlights. Shortly after turning onto Weber River Parkway, you might notice the river taking on a slightly different character. That’s how you know you’ve reached Ogden Kayak Park, where boulders have been purposefully placed in the Weber River to create a practice run for whitewater kayakers. A spacious viewing platform with picnic tables and grills makes this a great spot to take a refueling break while watching kayakers test their skills in the rapids below. A convenient bike Fixit station is right by the viewing deck, in case you need any repairs by this point. This historic park has ties to the American mountain men of the fur trapping era as well as Mormon settlers. Today, the 84-acre park stretches along the Weber River with several walking and biking trails, a campground, an 18-hole disc golf course and a canoe pond. The Centennial Trail crosses the main park entrance, and shortly thereafter, a bridge over the Weber River offers another route into the park. Still within the bounds of Fort Buenaventura Park, Kingfisher Wetlands is a natural estuary right beside the Centennial Trail. For a quick glimpse at the wetlands and a chance to spot unique birds like kingfishers, red-winged blackbirds and flickers, walk up the steps to the viewing platform adjacent to the trail. A mostly flat, 0.6-mile gravel loop travels around the wetlands and makes for a peaceful ride with more bird viewing opportunities before bringing you back to the Centennial Trail. Only the thinnest of road bike tires would have trouble cycling this loop. While the Ogden and Weber River Parkways offer easy cycling on asphalt, the portion of the Centennial Trail that coincides with the Bonneville Shoreline Trail (6.5 miles) and the Beus Canyon Trail (0.5 miles) is best suited for intermediate to advanced mountain bikers. There are several trailheads for accessing the Bonneville Shoreline Trail throughout Ogden. Those looking to ride this section from north to south can start at the Rainbow Gardens Trailhead near the mouth of Ogden Canyon, while those cycling south to north can start at the Beus Canyon Trailhead. These trails feature several steep climbs, technical rocky sections, and full-value descents as they follow along the east bench of Ogden on the flanks of the stunning Wasatch Mountain Range. Those who choose to take on this challenging trail will be rewarded by riding in a pristine mountain setting across several rugged canyons. Written by Jenna Herzog for RootsRated in partnership with Utah Office of Tourism.